Bolt came into Cats Protection care in June of this year. He had been a stray on the streets of Bow Street for at least a year prior to this, being regularly fed by a lady who said that often he would appear, sodden from rain and bedraggled. 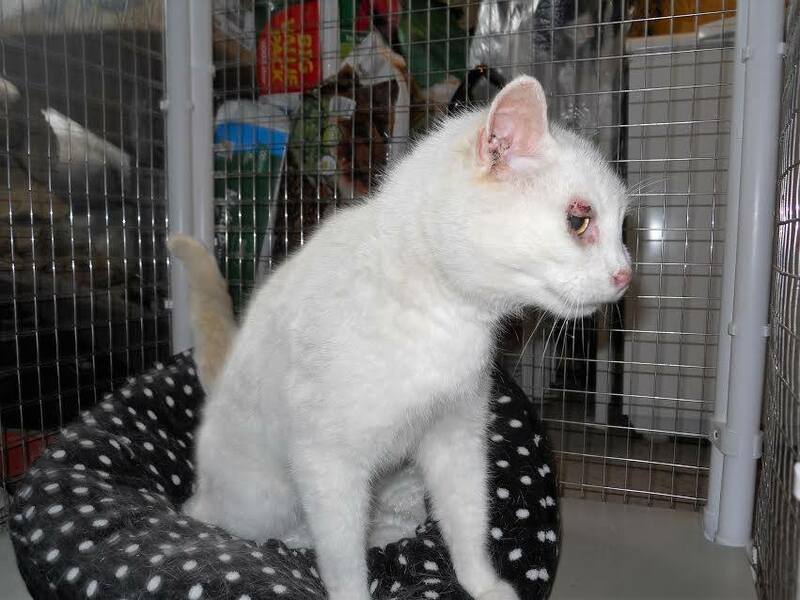 He had obviously been in several fights with other cats, which we would say he mostly lost given the scars on his face and his floppy left ear. When he came to us, it became obvious he liked his food which he would wolf down and then look for more. We had almost decided to christen him ‘Oliver’ because of this, presumably a practice he had picked up from being a stray and not knowing where his next meal would come from. Of concern to us was a swelling on his face on the left side and a bulging mass causing his right eye to remain closed. Bad news from the vet, the left swelling was undeterminable, but through biopsy on the right side, cancer was diagnosed which resulted in cutting away the affected area, which in turn meant losing his right eye as well. The vet did a fantastic job which left him with a clean bill of health. It was in these initial treatments at the vets when we were asked to name him. On the spur of the moment, and without much thought, Bob came up with ‘Bolt’, as he said ‘he is quick on his paws’! We were also told that Bolt had, at some time been run over, as his hind legs were stiff and fairly unstable. He also has arthritis, again as a result of time on the streets and his age which couldn’t be determined, but was easily over 8 years. While in our care, Bolt stole into our hearts. He would regularly sit on both our laps while being stroked, purring and dribbling in large quantities. When it became time for rehoming, we just couldn’t let him go, so the old and battered, smelly, dribbly adorable cat became ours. He still has a huge appetite, and he is still nervous when people move around him quickly but he has settled into our home and, even if our cats are warry of him, he enjoys our company and enjoys dribbling into our laps.